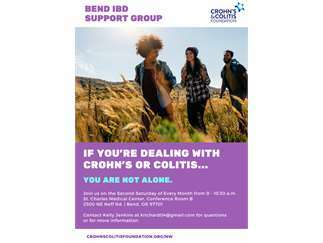 Join us for the first meeting of a new support group in Bend! Share your stories and experiences, exchange disease management tips, and make friends with people in your community who also suffer from inflammatory bowel disease. Parents, family, friends, and healthcare providers are welcome to attend. Saturday, July 14th, 9:00 a.m.